He was, the record shows, some 74 or 75 years old, living with his son Jeremiah. He had some money coming to him from a mortgage on some property in New York, and had a few hundred dollars in cash of his own. And, the record makes it abundantly clear, he was steaming mad. His name was Ezra Gladding. 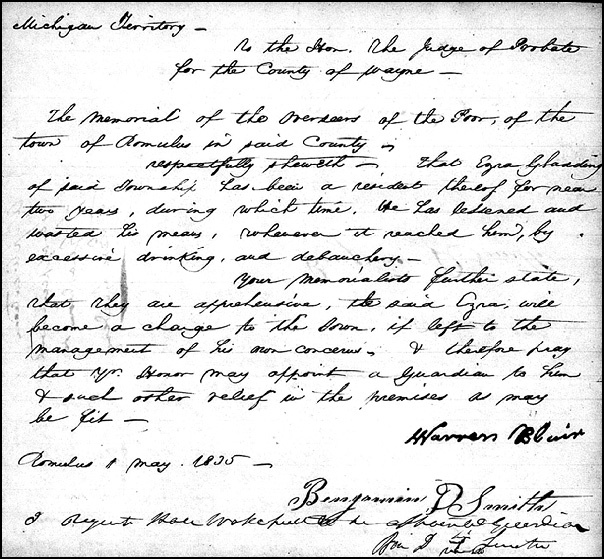 He lived in the town of Romulus, in Wayne County, in what was then the Territory of Michigan, and he was not at all happy with a label that had been stuck on him by the Probate Court in 1835. And that’s when the fur started flying. It’s one of those wonderful kinds of court records that add so much color to a family history. But what’s with this spendthrift bit? And just how was someone liable to be put under guardianship, and why? You even, The Legal Genealogist will bet, know where to look for the specifics. Note that the kicker here is the risk that the town or the county or the jurisdiction at some level will end up footing the bill for the spendthrift and/or his family. It’s not so much social welfare, to care for the spendthrift, as much as it is preventive medicine, so the taxpayers don’t end up paying. Many jurisdictions had these laws; you’ll find both statutory provisions and court records on spendthrifts in both colonial and early state records all over North America. Well, Hale Wakefield gave up, sold out and moved on, and on the 6th of December 1836 the court removed Wakefield as guardian. There’s nothing in the file about Gladding’s behavior after that. Note: The Latin phrase Quis custodiet ipsos custodes? is usually translated as “who will watch the watchmen?” or “who will guard the guardians?” See Wikipedia (http://www.wikipedia.com), “Quis custodiet ipsos custodes?,” rev. 22 Sep 2014. 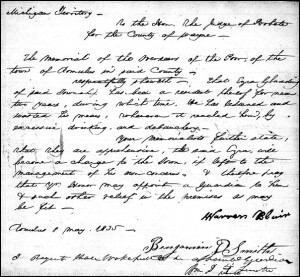 Good timing … I was wondering about that one — I am indexing the early Oakland County MI Probate Calendar that FamilySearch has online but not indexed, and so far came across only one case of spendthrift: Joseph O Crain was assigned a guardian (Richard Boughton) in 1848. Glad the timing worked out!! I am a Michigan-based genealogist and just ran across a spendthrift case for a client for the first time. I understood the meaning of the term but was not privy to the legal details. Thank you Judy for this wonderful article. In my client’s case, his wife had just died leaving him with a newborn son, four minor children, and one 16-year old boy. It does appear that the court (guardian’s) removed the children from the father and placed them with local families who raised the children until 18. The father’s guardianship was dropped three years later at the advice of a few character witnesses but nothing is said about his fatherhood being restored. Was this common for children to be removed? It was never common for children to be removed from a father (much more common for them to be removed from their mother), but the spendthrift thing would do it.